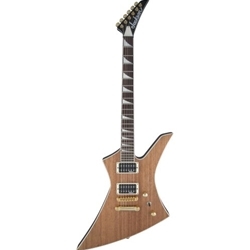 You don't need to sacrifice tone or style with the Jackson X Series Kelly KEXT electric guitar. You've got two high-output Jackson humbucking pickups able to deliver some of the most aggressive tones out there. And your tuning will remain rock-solid while you bash out your heaviest riffs thanks to the TOM-style hardtail bridge. Best of all, the compound-radius fretboard means you'll have exceptional playability along the entire length of the neck. Crank up your favorite amplifier, dig into a big fat chord, and the Kelly KEXT absolutely sings. The engine that drives the X Series Kelly KEXT solidbody electric guitar is a pair of Jackson's own high-output humbucking pickups. Many players live and die by pickups like these, humbuckers that can drive the front end of your amplifier or dirt stompbox to attain the most gain, compression, and tight low end possible. And these Jackson humbuckers are passive, ensuring you'll still retain the dynamic response that only passives can achieve. If power is what you're looking for, these pickups deliver.